As you might imagine, London leads the charge with the largest number of artists one city in the UK is sending to SXSW 2017. In this post, we introduce you to the acts from London Town in the genre of pop who received a shout for SXSW this year. The summaries of acts below were written by Rebecca Clayton, Steven Loftin and David Wriglesworth; where noted, some acts have dropped out. Please note: all information we bring you about SXSW 2017 is to the best of our knowledge when it posts and artists and bands scheduled to appear may be subject to change. To learn when your favourite artist is playing in Austin, we recommend you first consult the official SXSW schedule, then stop by the artist’s Facebook and official Web site for details of any non-official SXSW appearances. Zimbabwean-born ESKA is best described as an amalgamation of the psyche soul of Minnie Riperton, with the whimsical melodic twists of Kate Bush, arranged into an intoxicating meld for the post-digital age. Megan Markwick and Lily Somerville are better known as IDER. Since moving in together, the duo worked tirelessly on their project and emerged in April 2016 with their debut track, ‘Sorry’. Within minutes of the track going live on Soundcloud, Sorry received huge support from BBC Radio 1’s Phil Taggart, who labeled IDER as one of his “Future Firsts” on his weekly show. Two months later, IDER released their follow-up track, the vulnerable, yet beautifully balanced ‘Pulse’, which has since received over 1,000,000 streams on Spotify. This was followed by the release of ‘King Ruby’ and ‘Million’. Joel Sarakula is an Australian-born, UK-based soulful pop producer and singer-songwriter, who has travelled the world in search of his muse, gazing through his vintage glasses at his ‘70s tinged world. In 2013, Joel Sarakula released his debut album ‘The Golden Age’. Singles ‘Bohemian’ and ‘I Will Deliver’ received numerous plays across BBC 6 Music, BBC London, XFM, Q Radio and Absolute Radio. Fans didn’t have to wait long for his follow-up, ‘The Imposter’, which hit store shelves in November 2015. This latest album took him to London, Berlin and Sydney, with a host of his musical comrades appearing on the record. In 2011, an inexperienced Kate Sproule turned down her first-post college job to pursue a music career to form Mt. Wolf (pictured at top), alongside her childhood friend Stevie McMinn and his college mates. The risk paid off as, after only two EPs into their career, Mt. Wolf became established as a signature sound. However, the band announced their decision to split 2 years later, due to creative differences in the band. After a year’s hiatus, Mt. Wolf reunited with a new line-up as pictured at top, consisting of Sebastian Fox (vocals/guitar), Stevie McMinn (guitar) and Alex Mitchell (drums). The band’s electronic and acoustic elements have earned them comparisons to the likes of London Grammar, Mogwai and Sigur Ros. Hannah Rodgers, better known as Pixx, is a young singer/songwriter from Chipstead on the outskirts of London. Born to a music-loving family, Pixx’s creative side was nurtured and encouraged from a young age, with her talent earning her a place at The BRIT School, which also counts Adele, Ella Eyre and the late Amy Winehouse among its alumni. Inspired by the likes of Bob Dylan, Joni Mitchell and Aphex Twin, Pixx – whose name is adopted from her grandmother’s nickname – released her recording debut ‘Fall In’ in August 2015. This was quickly followed by dreamy, synth-pop tracks ‘Baboo’ and ‘Grip’. Once upon a time, Roses Gabor was working at a bank while working on her music career on evenings and weekends. In 2005 she sang on the Gorillaz track ‘Dare’, and since then she has appeared at a number of the band’s shows and tours to provide vocals, and featured on a number of other artists’ tracks, including SBTRKT’s ‘Pharoahs’ released back in 2011. More recently she’s featured on Basstrack’s funk-inspired ‘Get Your Way’. Sykes are a sparkly, electro alt-pop outfit from London, made up of lead singer Julia Sykes, lead guitar/ bass player Kristian Taylor and Will Grid Brown on drums. Unsigned, the band is yet to release an album but they have shared a bunch of singles/EPs since they started writing together. The band has been featured on Radio 1, and they have supported the likes of Bleachers and Charli XCX live, as well as appearing at a number of festivals including Glastonbury. As you might imagine, London leads the charge with the largest number of artists one city in the UK is sending to SXSW 2017. In this post, we introduce you to 11 acts from London Town specialising in electronic music and DJaying. The summaries of acts below were written by Mary Chang, Rebecca Clayton, Steven Loftin and David Wriglesworth. Please note: all information we bring you about SXSW 2017 is to the best of our knowledge when it posts and artists and bands scheduled to appear may be subject to change. To learn when your favourite artist is playing in Austin, we recommend you first consult the official SXSW schedule, then stop by the artist’s Facebook and official Web site for details of any non-official SXSW appearances. Composing isn’t usually the most orthodox starting point for someone wanting to venture into a career in pop, but that’s exactly where Anna Meredith started her foray into music, and to great success. Before releasing her debut album, Meredith spent time as composer in residence with the BBC Scottish Symphony Orchestra, composed for the Proms, and gained a Masters at the Royal College of Music, amongst many other accolades. Duncan Beiny, better known as DJ Yoda, is a multi-award-winning hip-hop DJ and producer, who has worked with pretty much everyone, from classical composers to neuroscientists. In recent years, DJ Yoda was asked by Dr Dre to record a guest mix on his inaugural Beats 1 show for Apple Music, and he was one of the artists to perform at Banksy’s pop-up bemusement park Dismaland. DJ Yoda pioneers new forms of audiovisual entertainment, chopping and splicing classic movies with the hands-in-the-air clubbing vibe. In 2014, DJ Yoda was commissioned to rescore classic films as part of BFI’s sonic cinema event, and he produced a mash-up of BBC Radio 4’s entire station, remixing The Archers, the shipping forecast, John Humphries and more. Fifi Rong is London-based, but lived in China until she was 16 when she was enrolled in a boarding school in Bristol. She self-released her debut album ‘Wrong’ in 2013, and since then has worked with the likes of Skepta, featuring on his 2016 album ‘Konnichiwa’. In 2016, she released an EP, ‘Forbidden Desire’, which she funded through Pledgemusic. Croydon-born and bred, Jamie Isaac released his debut album ‘Couch Baby’ last year, a following two EPs released back in 2013 and 2014. Isaac attended BRIT School along with contemporary and sometime collaborator King Krule, but rather than following in the footsteps of the likes of Adele and Jessie J, Isaac is carving out a much different path. Of the many young artists coming out to SXSW 2017, few can say they’ve already been nominated for an award, let alone won one. Harry Yeff, better known under his stage name Reeps One, is thus special because he’s a prize-winning beatboxer. London-based producer and DJ Rude Kid is heavily entrenched in the grime scene, being able to cite the likes of Skepta, Wiley and Shy FX amongst his collaborators. Passionate about music, Rude Kid, who at one time was signed to Sony Music, released and experimental EP ‘One Week’ in 2012 which he created in just a week, before sharing as a free download. Life-long friends Dan Cobb and James Cullen comprise electronic duo Tender. From the basement of their North London home, they’ve produced three EPs, ‘Armour’, ‘Tender EP II’ and ‘Tender EP III’. To coincide with the duo signing with Brooklyn-based label Partisan Records in July 2016, Tender released ‘Outside’, the first single to be taken from their third EP. Since its release, the single has been streamed over 4,000,000 times on Spotify. Dario Darnell is no stranger to the electronic scene, having previously been in Picture Book with his brother Lorne Ashley. While Picture Book appears to be on hiatus at the moment, Darnell has struck out on his own as a one man multi-instrumentalist under the moniker Youngr. You could say that his career in music was pretty much assured: his father is none other than August Darnell, aka Kid Creole of Kid Creole and the Coconuts’ fame. ‘Love Is A Crow’ touches on how sometimes, regardless of how passionate and fulfilling a relationship between two people is initially, one person’s doubt and vulnerability can self-sabotage it. In light of that, something about this love becomes damaged and almost sinister, which I think comes across beautifully in the song’s music video. The new single is due for official release this Friday, the 24th of February, via Quiet Arch. The full release will include this version of the track, plus an instrumental version and remixes by The Cyclist and Die Hexen. The video was filmed in various East Berlin locations by director Joseph White. 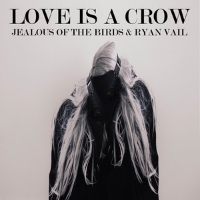 Perhaps not entirely by coincidence, Ryan Vail and Jealous of the Birds are both scheduled to appear at SXSW 2017 next month in Austin, Texas. For up-to-date information about SXSW, keep following TGTF’s ongoing festival preview coverage, or check out the official SXSW schedule of artist showcases here.